The Romanian Association of Banks (RAB) is one of the strongest professional associations in Romania which represents the entire banking market – made up of 34 banks active as Romanian or foreign legal persons in the financial sector – and which expanded by including other 6 new affiliate members, non-bank companies, thus setting the foundation of a partnership with the intention of contributing to the consolidation of a predictable, transparent and reliable business environment in Romania. The priorities of the banking industry are related to maintaining the banking sector’s role as main financier of Romania’s economy while assuring the stability and credibility of the banking sector. The Romanian Association of Banks has a twenty-seven-year tradition and has been a member of the European Banking Federation since 1991 (with full rights since 2007), of the European Payments Council, of the European Mortgage Federation, of the European Banking Institute and of 26 national lucrative bodies for developing and improving the economic framework. To this end, the banking community makes available over 800 experts from credit institutions and affiliate members who participate in 24 technical commissions. Established in May 1991 as a professional association, the Romanian Association of Banks includes currently 34 members, credit institutions with majority private or state-owned capital, branches and representative offices of foreign banks and 6 affiliate members. The Romanian Association of Banks concentrates the entire banking industry from Romania, being the voice of the banking sector in its relationship with the Romanian authorities, the International Monetary Fund, the European Commission, the World Bank and other domestic and international bodies. Its main objective is related to the representation and defence of its members’ rights and interests, especially now when regulations devised at European level for a well-regulated system can put additional pressure on banks’ activity. The Romanian Association of Banks has committed to playing an active role in promoting an open and constructive dialogue with all institutional decision-makers and with the business environment, when representing its members’ interests, and when developing the most sustainable approaches to public policies with impact upon the financial and banking sector and, in the end, upon Romania’s economy and the Romanians’ welfare. By eliminating the challenges facing the banking sector, especially the legal ones, consumers will be able to benefit from banking services at more competitive prices, while the companies from Romania will be able to compete as efficiently as possible on foreign markets. The banking community’s projects have as aim, among others, to enhance financial literacy via the Platform for Financial Education, to accelerate the introduction of digital technologies in financial and banking services via the Platform for the Digital Agenda next to the integration of financial intermediation, in order to boost the accessing of European funds, the development of Public-Private partnerships and the funding of large investment projects. 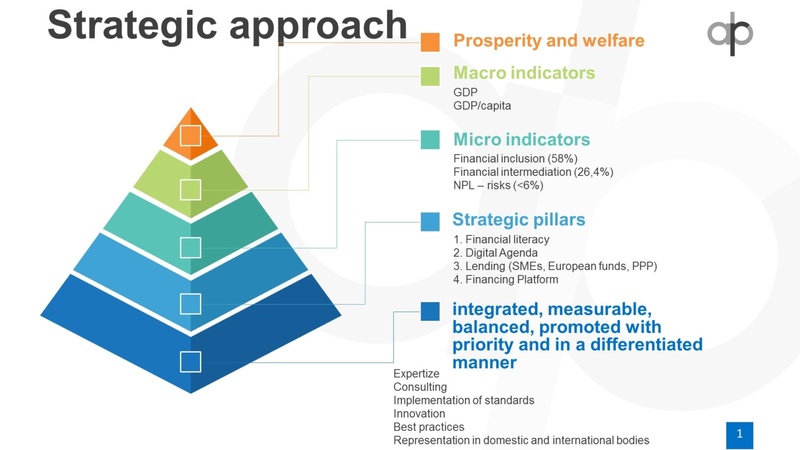 The banking sector focuses on three pillars, namely: financial inclusion (merely 58% in Romania compared to over 90% at European level) the digital agenda (last in Europe based on DESI, but number 2 as regards high speed connectivity) and financial education, where Romania ranks last in Europe 28 and where the banking sector could gain special traction in sustainably enhancing financial intermediation. The RAB activity must be seen as a transparent manner of promoting its interests and the proposals to change laws or amend them if the forecast impact is to produce negative effects for the banking sector and, implicitly, for the economy. RAB is consulted on on-going basis and answers the authorities’ requests as the representative body of the financial and banking business environment. 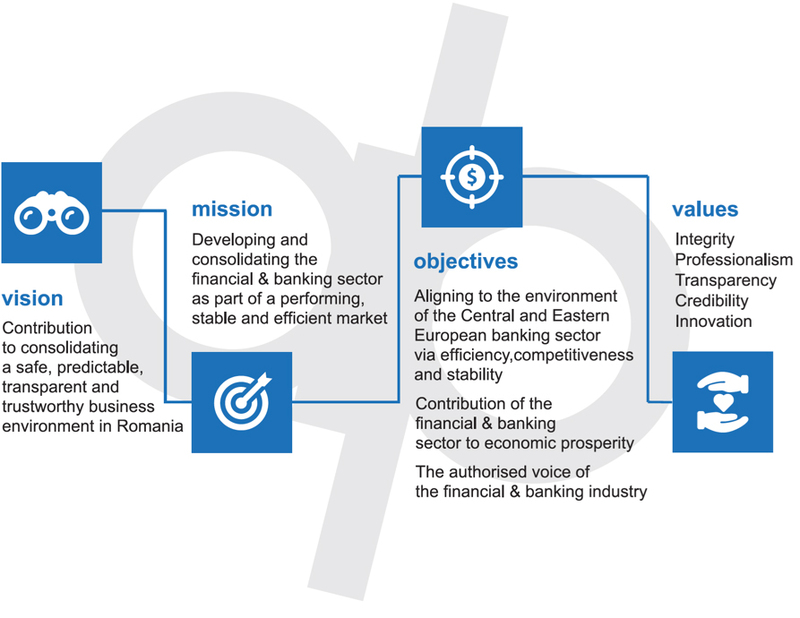 The ways in which the Romanian Association of Banks represents and promotes the Romanian banking sector’s interests include local actions before domestic decision-makers such as the Parliament, the Government, the National Bank of Romania, as well as representation actions at international level before the European Commission, the European Parliament and the International Monetary Fund. The setting up of the Romanian Banking Institute, of the Bank Deposit Guarantee Fund and of the Credit Bureau, the denomination of the national currency, the implementation of International Financial Reporting Standards (IFRS), the carrying out of financial education projects, the modernization of the Payments System, the setting up of a new reporting to the NBR system for banks, the standardization and the harmonization of payment processes – the SEPA project – are all part of the major projects that impacted RAB’s activity and its collaboration with the National Bank of Romania. The Romanian banking sector finances mainly the Romanian economy, providing about 80% of total funding granted by the Romanian financial sector. The banking sector of Romania which serves millions of customers has proven to be resilient during the crisis so that there was no need to support it with public money. RAB has been a member of the European Banking Federation since 1991 (with full rights since 2007), of the European Payments Council, of the European Mortgage Federation, of the European Banking Institute and of 26 national lucrative bodies for the developing and improving of the economic framework.